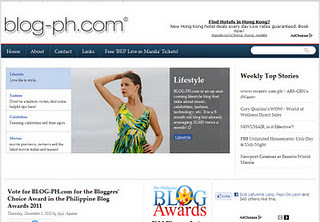 I vote for BLOG-PH.com for this year’s Philippine Blog Awards Bloggers’ Choice. BLOG-PH is authored by Jay-L Aquino- and one of the finalist in the ongoing Philippine Blog Awards and nominated for two more categories: Bloggers’ Choice Award and Lifestyle Category – National Level. I like the format, design and the post content especially in movies.That's why Im voting for Blog-PH for the Bloggers Choice Award in the PBA . Good Luck Blog Ph!